Another iteration of my “house golden saison” with only minor tweaks to the recipe but two new yeast blends. This batch is being split between the 7-gal Brew Bucket and a 3-gal glass carboy. 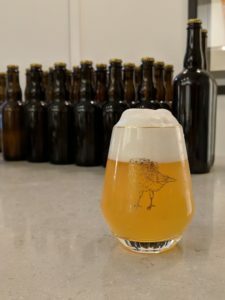 The former will receive Bootleg Biology’s “Mad Fermentationist” blend by Michael Tonsmere, while the latter will receive WYeast 3726 saison yeast and a pack of Bootleg’s “Funk Weapon 3”. So this time, neither half will be a ‘clean’ beer. Grain bill and mash / boil details remain the same as the previous few batches, but the flameout hops are updated from Nelson Sauvin to Hallertau Blanc for this batch. Future batches will likely go back to Nelson. 4.1 gallons collected in brew bucket, inoculated with BB Mad Fermentationist blend + BB Funk Weapon 3. Both received ~ 15 seconds pure O2 before yeast pitch and allowed to free rise in ~72F environment. 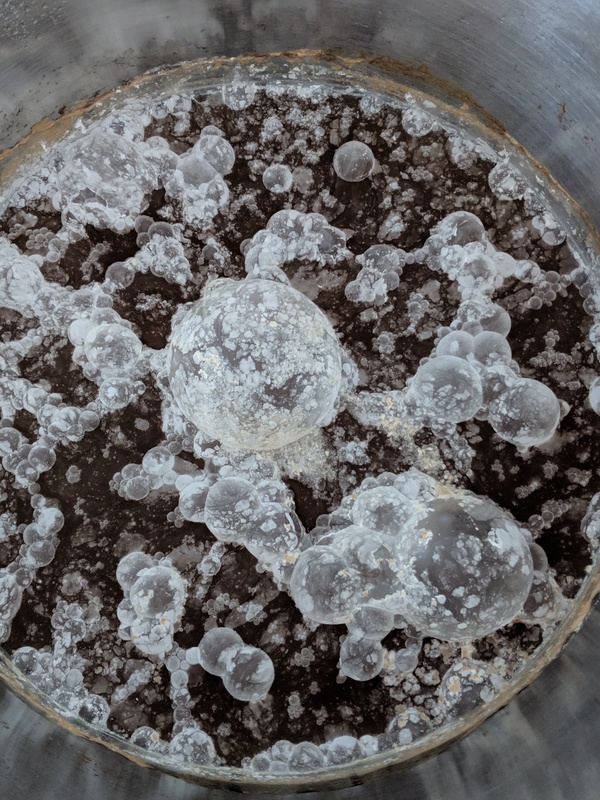 The 4.1 gallon portion with Mad Fermentationist was bottled on November 18 2018 and had a great pellicle already as shown below. FG was down to 1.004 at this time and 94g of table sugar was used to prime it to 2.7 volumes – intentionally on the lowish side, in case it continues to attenuate a couple more points. The 2.6 gallon portion with 3726/FW3 was bottled January 22, 2019 with 74g of table sugar for approximately 3.1 volumes of CO2. I didn’t check gravity but reason to suspect it’s at or near 1.000. Pictured above is 46a, the portion fermented with the Mad Fermentationist blend, after two months in bottle. Despite the short turnaround time, this beer is already excellent: loads of citrus and herbal complexity, good malt base, and just the right dash of acidity to quench. I am really impressed by the LAB in this blend in terms of hop-tolerance. I entered the ‘Mad Fermentationist’ version of this beer in the 2019 Cowtown Yeast Wranglers’ competition under category 28B, where it received scores of 35/50 and 37/50 but did not place. Notes were generally that it lacked enough brett or lactic character to shine in that category, resulting in insufficient depth of character. I feel that with some more age, this beer will likely score better.